This is my latest work created in my Northern Virginia studio. It is a familiar scene – Three Ridges. 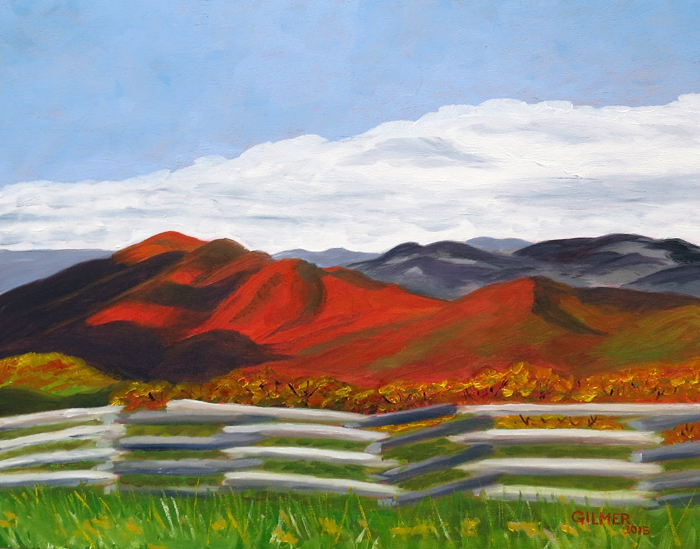 This was painted from a photo taken in the Fall from the overlook at the top of Devil’s Knob. I “enhanced” the fall color a bit. I also included the fence, something I didn’t used to do but now that I’m practicing more man made objects I’ve been including it. This painting is 16 x 12 Oil on canvas. I’m also working on a larger version of my earlier painting of Three Ridges in Cloud in my mountain studio. I want to replace the picture over the fireplace in the mountain house and it needs something big. It’s interesting redoing something that you’ve done before. The original impressionists did it all the time. I really like the first one I did so I want this one to be just as good. There’s no doubt it will be different. It is 48×24, so it will be my largest painting. It will be a while before it’s done, but I will post it when it is. Below is the first one I did (36×18) which I covered in an earlier post. 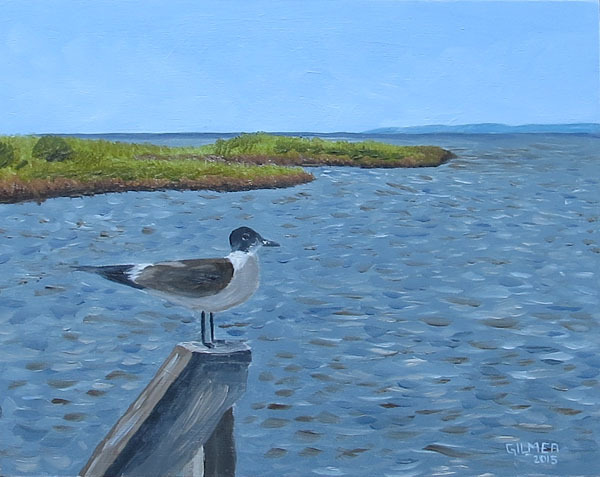 My Carolina Gull painting was accepted into the Wings show at Falls Church Arts. This show will run at ArtSpace in Falls Church from November 12th though January 3rd. See Shows & Press page for more information. Last Thursday I played hooky from work and took a plein aire workshop with a local artist named Christine Lashely. I found her because she was one of the chosen artists for the Bath County Plein Aire Festival, which I’ve been following because there is some overlap with artists that I know from classes at Nimrod Hall. I liked her art and noticed that she was local to Northern Virginia, so I got on her mailing list. The workshop was held at Ross Farm in Dickerson Maryland near Frederick. It was a lovely setting with a view of Sugarloaf Mountain and lovely barns and buildings. The leaves were pretty close to peak and it was a beautiful day. 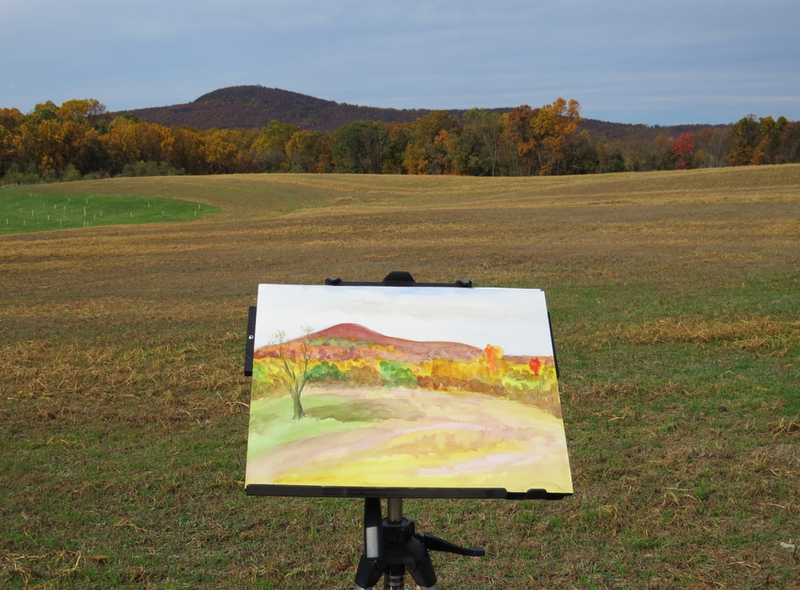 We started off with a watercolor of Sugarloaf. My watercolor skills are improving, but still challenged, and I got frustrated and put it away to start on an oil painting. Christine got me to bring it back out and provided some very helpful critique. One of the first things you learn about her is that she sees purple in everything, but she’s right! She got me to tone down the orange trees on the mountain with purple, which helped account for atmospheric distortion from the distance. She also got me to put on more layers of paint in general, making the work bolder and brighter and more complex. Below is the finished product. I say finished, but as it turns out plein aire painting doesn’t allow for perfect. That’s part of what makes it fun. You have to take what you get because you have a limited amount of time and the scene is always changing. Even with the challenges it has many advantages to painting from photos. You see colors that are much more vivid and the depth of the scene is not lost to the flatness of a photo. After we finished our watercolors we moved out of the wind a little – which was blowing hard enough to blow easels over. 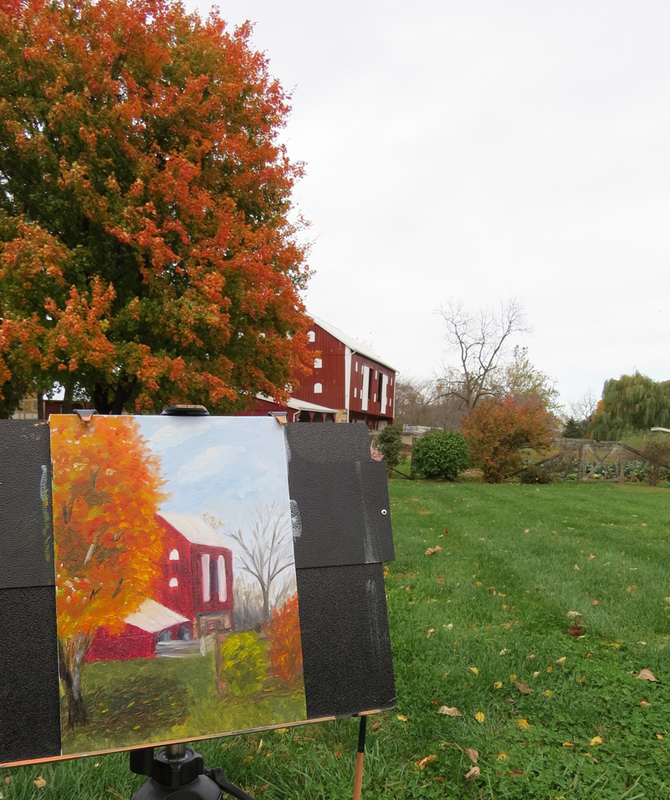 I chose to paint the big red barn and the brilliant orange tree that was next to it. I don’t like the perspective of my painting, but once again, plein aire doesn’t allow for perfect. I do like the colors and the rest of the scene. Once again, Christine provided critique that much improved the painting. Of course we added some purple which once again improved the scene more that I would imagine. She also helped with a new brush technique to smudge the paint in places. Below is the result of the oil painting session. Even a bad day plein aire painting is better than any day at the office. I need to do this more often!